First, a note of thanks to all the new readers and visitors to WAX Golf who have taken the opportunity to enjoy the discount on the 3 Video MCS Golf Swing series. I’ll be terminating the End Of Season sale soon, so there’s still time to get the last remaining available downloads! 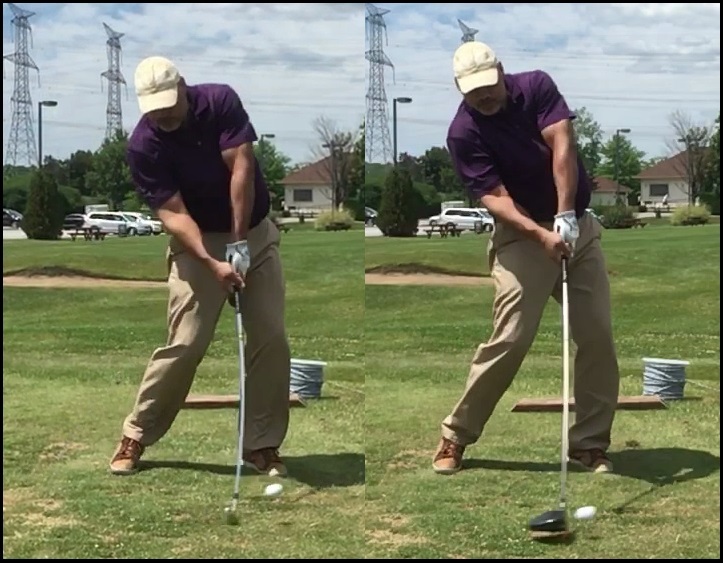 I explained in the video how, after barely swinging in the previous month and without having hit balls at all the week before I hit made some Driver swings at the TXG Golf facility in Toronto at the end of July, I had actually increased my swing speed slightly over the last session two months prior, when I had been hitting balls and swinging more regularly. So, Uncle JJ emailed me last Tuesday, and hadn’t even downloaded his version of the video yet, having been busy when I sent him the link. I’m playing in a tourney Monday, and I haven’t swung a club in 2 months!! Yikes. I’ll send you fresh links right now, and this is the perfect video to watch getting back into things. Good luck on Monday! That was the extent of the advice I gave him, bearing in mind that he already had the first 2 videos in the MCS Golf Swing trilogy, and would be well versed in the stance setup and pivot action of the MCS swing model. I figured that, with his base knowledge of the fundamentals, all he had to do was watch and implement the principles in the latest video. I played in a tourney yesterday, having not swung a club for over 2 months. My only preparation was watching the Kinetic Chain video’s. These video’s are the very best produced by DJ, in my opinion. …At any rate, thanks, DJ, the new video’s are awesome! Way to go JJ on the 80 after 2 months off even swinging, and thanks for taking my advice and in doing so proving what I have been saying about how to properly pivot and use the ground to leverage that golf club! This entry was posted in Address Procedure, Leverage, MCS Kinetic Chain, One Major Move, Pivot, Using The Ground and tagged Address Procedure, Leverage, MCS - The Kinetic Chain, One Major Move, Pivot, Using The Ground on October 30, 2018 by D Watts. All true! And may I add a few things. For me, there always has to be one or two things that make something click – a eureka moment, so to speak. I’ve watched every one of DJ’s videos, and it wasn’t until the Kinetic Chain, that it all finally clicked for me. Highly recommend. And one anecdote from my round yesterday. On the one par 3 I mentioned in my other comment, my buddy made an interesting comment. He’s a scratch golfer. He said, “I was looking at the ground during your swing, and when you made impact, it startled me! I’ve never heard that kind of compression and pop from your swing.” Made me feel good. I hit my 6-iron about 185 – 15-20 yards longer than I’ve ever hit it. I also reached a par 5 in 2 – driver, 5-iron. Rare for me. I’m now itching to get back out there and play! … I hit my 6-iron about 185 – 15-20 yards longer than I’ve ever hit it. I believe your buddy was experiencing the MCS “pop” in the “Drop & Pop,” my friend!